The Model Railway Club is recognised by the Guinness Book of Records as the longest-established model railway society in the world, having been formed in 1910. The Model Railway Club (MRC) has been synonymous with the hobby for over 100 years, with many famous members including Peter Denny (builder of the iconic Buckingham Great Central layout) and C J Freezer (Former editor of the Railway Modeller magazine). The clubs exhibition at Westminster Hall was for much of the 20th Century ‘the’ exhibition. Today, the MRC is the largest model railway club in the UK, based on the number of members. The MRC wanted their new website to attract new members, not just in London, but across the UK. In particular, the MRC wanted to attract a younger generation of modellers in their 20s, 30s and 40s, as well as modellers aged 8-14 for their monthly YMRC club. 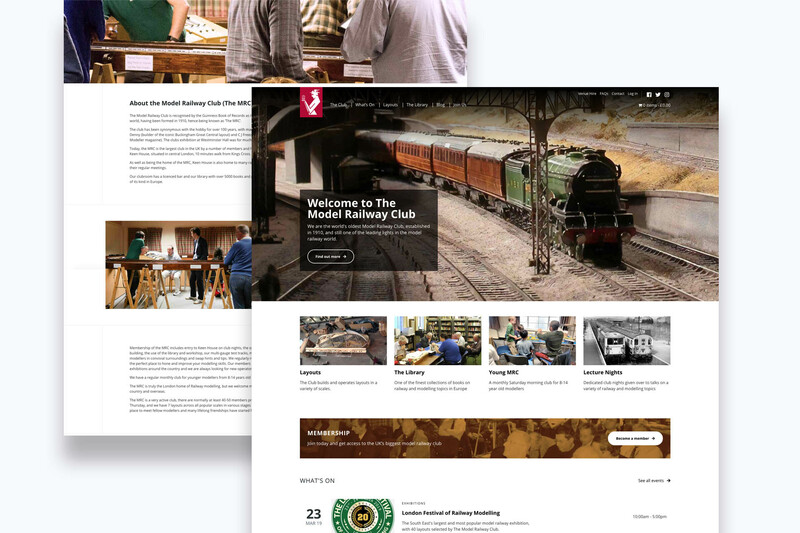 Our goal was to produce the best model railway club website to complement the branding of the MRC and to maintain their leading position in the hobby. We worked closely with the MRC to build a new responsive membership website, and online membership management tools using industry-standard WordPress software. Because the new MRC website is built in WordPress with a bespoke administrator backend, web pages and blogs can now be added easily by MRC volunteers with minimal training. To reinforce MRC’s heritage and branding, a photo shoot of a number of their meetings and workshops were used throughout their new website design. The new MRC website is mobile-friendly, which will help them to target the younger generation of modellers who prefer to sign-up and manage their membership on mobile devices. The most important goal for the MRC website was to add instant online instant sign up for members to help MRC to boost their online membership acquisition. Previously, the MRC’s membership sign-up process involved a lot of paper-work and committee approval. This meant that it could take up to three months for new members to join. The MRC recently updated their rules to allow for a new category of associate members who could join immediately to help them improve member acquisition online. Our solution implements the MRC’s new membership class to enable a new instant online-sign up process. The simple and clear design of the MRC website helps visitors to understand the different types of membership. Members can choose their type of membership and frequency by simply clicking their chosen option on the drop-down menu underneath a membership listing. Once a user has chosen their membership type and frequency they are directed to the member sign-up form where they can purchase or renew their membership using Direct Debit, Gocardless or Paypal. Once a prospect has signed-up, their new membership card will print automatically at the MRC’s office at Keen House, St Pancras and be sent to them. The MRC’s new website includes a purpose-built and easy to use IT membership system, so once a member has signed-up or renewed their membership, it can be managed by MRC’s volunteers. The all new membership portal contains several bespoke features to help members renew their membership, access membership information, and book rooms for events. Later this year, the membership portal will include a custom forum to allow MRC members to share ideas and discussions, and an online shop to sell merchandise. Before we built their new website, the MRC’s member renewals process was a laborious paper-based process. Our self-service renewal function now lets members instantly renew and manage their membership online. Using WordPress, we built a bespoke admin area for MRC’s membership volunteer team. Because most volunteers aren’t IT specialists we made the MCR membership management areas to be very user-friendly – which isn’t the case with most out-of-the-box solutions. The membership management dashboard displays a summary of membership activity and information, including recently signed up members, members who need to renew, and total member numbers by category. If a member is due to renew then the MRC membership manager can send a one-click renewal reminder to that member through the membership management dashboard. The membership management area includes email functionality so that the MRC can easily distribute membership emails to their email lists, for example, new members get a welcome email with details of upcoming events, and a link to download the MRC membership handbook. To help manage their busy schedule of events, a new events calendar and events management functionality were added. Volunteers can upload and market new events, and members can easily view and book their places. WordPress was chosen for the website’s back office system to keep things simple. The MRC website is hosted on Artonezero’s secure servers based in Telehouse North in London. The new MRC website is now live, and new members can join online instantly. The MRC now benefits from a modern responsive website which is easy for the MRC’s volunteer team to use and manage, and makes updating events and membership accounts a quicker, simpler and completely online process. With the new instant online sign-up process, MRC members benefit from being able to sign up and manage their memberships on their own devices, without the long timescale and barriers to joining that the old paper-based systems required. With the new website and membership management tools now in place, MRC can expect to reach their goal of recruiting the next generation of younger modellers and maintain their respected heritage among model railway hobbyists and enthusiasts across the country. You can see the MRC’s all-new website by clicking here.